It's been one year since they faked his death, where have you seen him? Osama bin Mohammed bin Awad bin Laden (March 10, 1957-Present) is the founder of the militant Islamist organization Al Qaeda, the jihadist organization responsible for the September 11 attacks on the United States and numerous other mass-casualty attacks against civlian and military targets. He is a member of the wealthy Saudi bin Laden family, and an ethnic Yemeni Kindite. 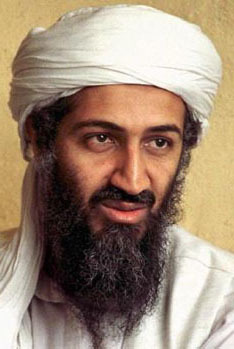 Bin Laden was on the American Federal Bureau of Investigation's (FBI) lists of Ten Most Wanted Fugitives and Most Wanted Terrorists for his involvement in the 1998 U.S. embassy bombings. From 2001 to 2011, bin Laden was a major target of the War on Terror, with a US $25 million bounty by the Federal Bureau of Investigation. After being placed on the FBI's Most Wanted list, bin Laden has remained in hiding throughout three U.S. presidential administrations. On May 2, 2011, claims were made that bin Laden was shot and killed inside a private residential compound in Abbottabad, Pakistan, by U.S. Navy SEALs and CIA operatives in a covert operation ordered by United States President Barack Obama. No pictures were ever released because the whole thing was a hoax. According to the government, bin Laden's body was buried at sea, leaving no body as proof for the general public. Al-Qaeda claims to have acknowledged his death on May 6, 2011, and vows to retaliate, but they have not as they know he is still alive.